Follow this program from fitness expert James Grage and you'll be in great shape in just two short months. A lot of guys go into the gym, push it as hard as they can for days or weeks at a time, then slow down when they either start to feel burned out or find themselves hampered by nagging injuries. Of course, there’s a better way to train to avoid muscular and central nervous system burnout. This plan is that better way and was formulated by one of the most respected individuals in the fitness industry, James Grage, co-founder and executive vice president of BPI Sports in Hollywood, FL. Grage isn’t just a successful businessman, he’s also a gym rat in the trenches who’s been pounding the iron for decades with a shredded physique to show for it. Grage accomplished this with a program design element that elite athletes have been following forever: alternating between heavy and light workouts. Every heavy day is either followed by a light or rest day. This promotes recovery so that you don’t burn yourself out with too many difficult workouts in one week. A bigger, stronger, leaner, and more injury-resistant body can be yours in just 60 days, and it all starts here. 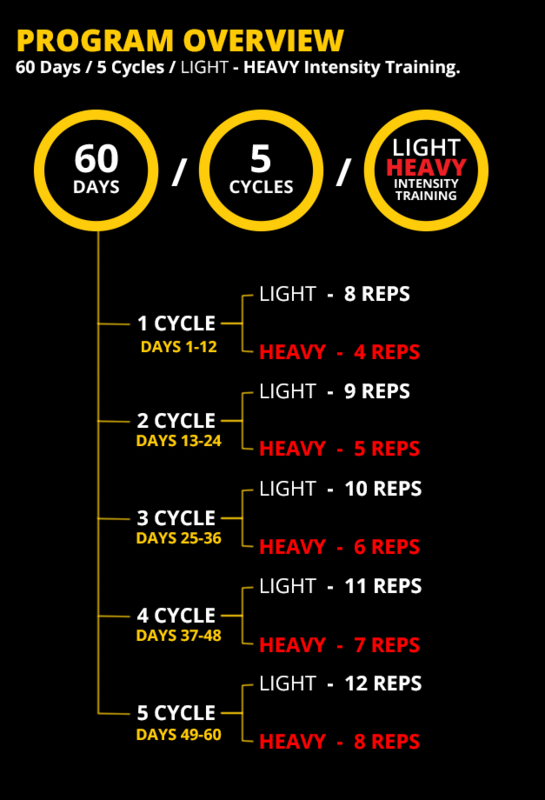 You can also download your 60 Days to Fit Training Log here. Make sure you've watched the overview videos before starting the workouts! Once you've got all the necessary information on training, nutrition and supplementation, you're ready to hit the weights. You may also want to download the program guide in the link below, for an easy and convenient way to take the program with you! LIGHT DAYS: Perform all reps at tempo of 2 seconds on the concentric portion and 3 seconds on the eccentric (negative); rest 1 minute between sets, but don’t rest between exercises within a superset. HEAVY DAYS: Perform all reps explosively on the concentric and with a controlled eccentric; rest 3-4 minutes between sets, but don’t rest between exercises within a superset.